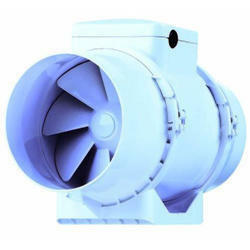 We are highly acclaimed in the industry for offering an optimum quality range of Mixed Flow Inline Fan. We are a leading Manufacturer of mixed flow fan, mixed flow fans, kitchen exhaust axial flow fans, inline fan, belt drive axial fan and inline fans from Faridabad, India. 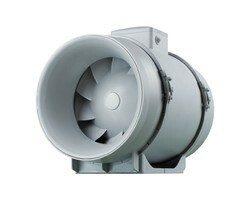 Mixed Flow Inline Fan (AF U Series) • Direct Driven Type, Mixed Flow Impeller. • High Efficiency and Low Sound Level. • Dual Speed Motor (Rating IPX4). • Size 100 to 315 mm Diameter. • Air Performance upto 2300 CMH. • Static Pressure upto 73.5 mm Wg. Double flange casing is produced in galvanised sheet steel or mild steel. Aventa 125Bin-line is a mixed flow fan. Available in high-performance two speed versions. They are less bulky than large in-line centrifugal fans and can be installed in loft spaces or service shafts. Our range of ultra silent, high efficiency Mixed Flow Inline Fan (AFTT Series) are optimum solution for silent indoor application. Our AFTT Series fan combine powerful characteristics and excellent aerodynamics of Centrifugal & Axial Fan by giving wide range of Air Performance at relatively less sound level. High efficiency mixed flow design impeller manufactured in aluminum alloy having pressure higher than axial fan, flow rate larger than centrifugal fan. Totally enclosed class F motor, to a min. IP54 protection are fitted as standard. The mixed flow (or axial impulse) fan is a cost-effective alternative to an axial flow fan in situations where capital cost and resistance to erosion are as important as power consumption.